Albert Einstein put it brilliantly: “Problems cannot be solved at the same level of awareness that created them.” Some unknown Texas genius put it simply: “If all you ever do is all you’ve ever done, then all you’ll ever get is all you ever got.” It’s hard to put it any better: These two bits of timeless wisdom capture the spirit of the times in which we work, compete, and lead. We are living through the age of disruption. You can’t do big things if you’re content with doing things a little better than everyone else or a little differently than how you did them before. In an era of hyper-competition and non-stop dislocation, the only way to stand out from the crowd is to stand for something special. 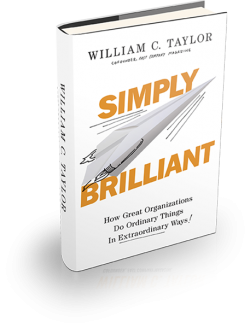 Today, the most successful organizations don’t just out-compete their rivals. They redefine the terms of competition by embracing one-of-a-kind ideas in a world filled with me-too thinking. Practically Radical offers a new set of messages for a different set of challenges. A pre-publication review in Publishers Weekly calls the book “an engaging and briskly written read” that will “captivate and benefit” leaders who are committed to making real change. Indeed, the book is meant as a guide for leaders in all walks of life who aspire to fix what’s wrong with their organizations, to launch new initiatives with the best chance to succeed, and to rethink the logic of leadership itself as they rally their colleagues around an agenda for renewal. In other words, it is a manifesto for change and a manual for achieving it—at a moment when change is the name of the game. Using lessons drawn from a wide variety of fields (from healthcare to software, from automobiles to financial services, from hotels to hospitals) Bill shows readers how to transform their company, shake up their industry, and recharge themselves. The urgent message: Don’t use the long shadow of economic crisis and slow recovery as an excuse to downsize your dreams or stop taking chances. The challenge for leaders in every field is to emerge from turbulent times with closer connections to their customers, with more energy and creativity from their people, and with greater distance between them and their rivals. 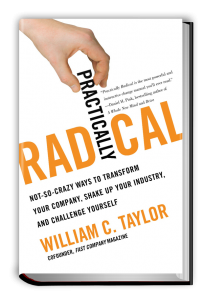 Practically Radical offers big ideas, proven techniques, and insightful case studies to help leaders meet the challenge. For a more extensive introduction to the core messages, hands- on practices, and in-depth case studies in Practically Radical, you can download and share the Practically Radical Preview.